10 Creative Ways to Drink More Water - The Co.
I’ve said it before and I’ll say it again, getting enough water throughout the day is crucial for so many reasons, including proper hydration, cleansing, healthy skin and weight loss. Although water is a key part of a healthy lifestyle, many of us struggle with getting the ideal amount of water (eight 8-ounce glasses) each day. But have you ever thought of adding berries or cucumbers to your water to make it taste more flavourful? Or downloading an app that tracks your water intake and gives you hydration reminders? There are creative ways to drink more water that will keep you happy and healthy each and every day. With these 10 creative tips, getting your water fix has never been easier. Make a point to purchase a nice water bottle that you really love and are happy to bring with you everywhere from the office to the gym. Investing in a water bottle you love will make it more likely for you to use it each day. There really is an app for everything, even keeping track of your water intake. This makes it easier to follow your pace and analyze your water consumption throughout the day; they even provide you with hydration reminders. Waterlogged and Daily Water are two great apps! Add in fruits like berries and apples, or veggies like cucumbers to give your water some extra flavour! It will be more enjoyable and easier to get the right amount throughout the day. Instead of ordering a soft drink or a Caesar when you’re out at a restaurant, opt for a glass of water. Not only is it healthier, it saves you money. Win, win. Another great way to consume more water is by eating water-rich foods such as cucumbers, watermelons, salad greens and melons. Munching on these will keep you hydrated and refreshed as you go about your day. If you’re anything like me, you have a morning and night routine you stick to on the daily. Drink water as part of these routines. For me, drinking water right before bed isn’t ideal as I have the world’s smallest bladder, but downing a glass after I brush my teeth in the morning is a great way to start the day off on the right foot. This is something I’ve done since I was young; most likely because my mom does it too. With my morning glass of orange juice, I add only a little bit of juice while most of the cup I fill up with water. Now a full cup of orange juice is way too sweet. Another great option is adding sparkling water to your juices, for an extra refreshing kick! Drinking tea is an awesome way to consume more water. And since tea has become so popular in recent years, there are tons of healthy and flavourful options to choose from! Keep your water with you wherever you go. That way, when your thirsty it will be sitting right there and you’ll be more likely to sip on it then going to buy a coffee. Whether you make a DIY water bottle that tracks your hourly intake, or keep a schedule in your agenda, tracking your water consumption will help you stay on track and get the optimal amount throughout the day! 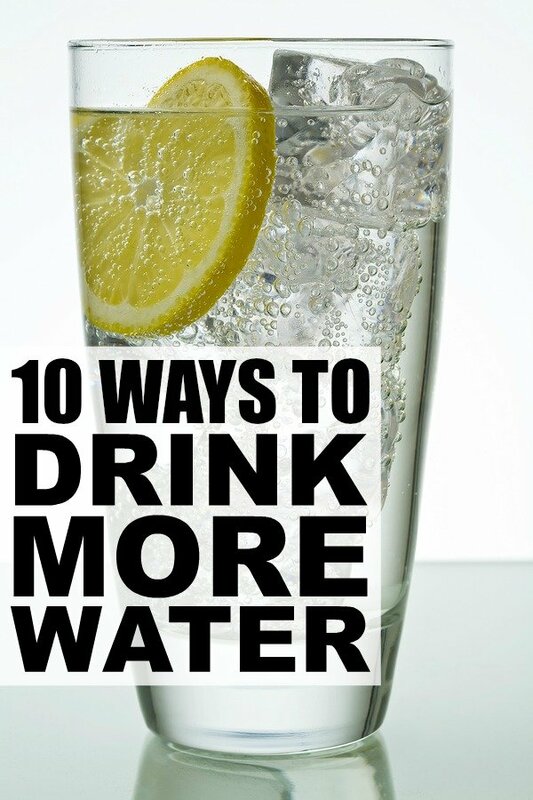 If you found these creative ways to drink more water helpful, please share them on Pinterest! And if you’re looking for more healthy tips and tricks, please follow our Health & Fitness board! This is an excerpt from the article 10 Creative Ways to Drink More Water which originally appeared on http://www.cloudywithachanceofwine.com/.